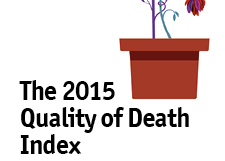 The Economist published their Quality of Death Index report this week showing Australia ranking in the top 4 for most indicators of palliative and end of life care. The lowest score for Australia was in Community Engagement. The score for ‘Community Engagement’ reflects the performance of the country in raising public awareness of palliative care, and in supporting volunteer workers for palliative care. On the score of Community Engagement we ranked 9th out of the 80 countries studied. The report indicates that the Australian public has a somewhat good (rather than strong) understanding and awareness of palliative care. We shared 9th place with the US, Canada, Norway and the Netherlands. Our neighbours New Zealand ranked equal first. Spare a thought for the volunteers in France where volunteering is highly regulated and volunteers are limited in what tasks they can perform. “It’s hard to be a volunteer,” says Dr de la Tour. “The training is too long and there are many things they can’t do.” She cites activities such as organising birthday parties, making flower arrangements or doing the shopping. “And a hospice with a garden can’t have volunteers doing the gardening,” she adds (p46).